The past two weeks have been a whirlwind of activity at Boston Handmade Downtown with events, exhibitors delivering new items, and customers finding us through all of the great press we have been receiving. Since our opening on November 28th we have been visited by many of our Downtown Crossing neighbors who have all been extremely welcoming. 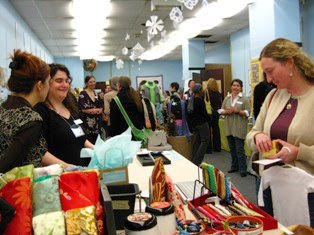 We have shared our love of everything handmade with everyone who crosses our threshold, and we hosted a reception celebration on December 4th during which we had more than 100 people visit, shop, and snack on treats provided by Ivy Restaurant. 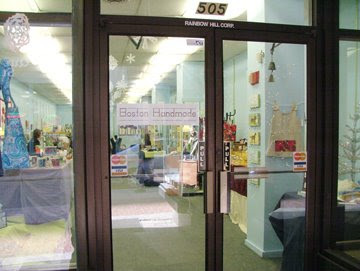 Handmade items from Boston Handmade Downtown make such great gifts because they are unique, locally made, and have that special touch showing your friends and loved ones that you did something extra thoughtful by giving them a gift crafted by hand that they won't find anywhere else. 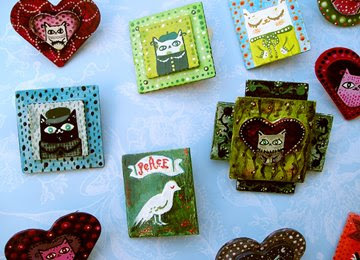 New items from gallery exhibitors are being delivered each week, like these hand-painted miniature paintings turned into wearable art pins created by Kathy Weller. Also new this week will be jewelry by Lush Beads and Little Wishes, accessories by Blue Alvarez Designs, and more! For those of you who knit and crochet you surely know of the international on-line knitting and crochet community called Ravelry. The founders of this amazing web site are based in Boston and stopped by Boston Handmade Downtown to check out what we've been up to. 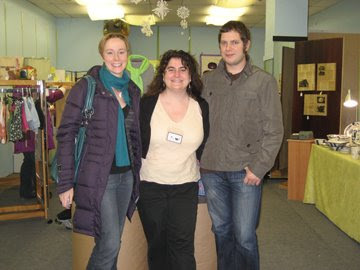 It was such a treat to meet Jess and Casey in person after experiencing the amazing on-line world that they have built connecting textile crafters all over the world. Thanks for visiting! 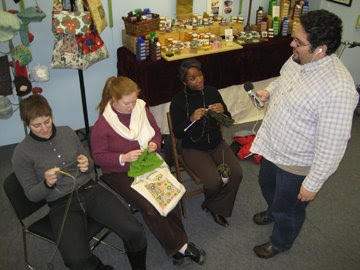 Also in yarn news, we were paid a visit early this week by Guido Stein of It's A Purl Man who interviewed a few of our gallery exhibitors about their craft and what they were making especially for the holiday season. 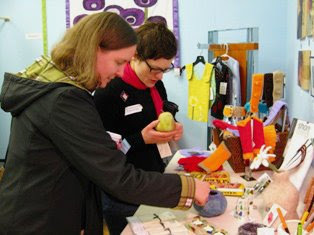 Jen of Blue Alvarez, Lynne of Cozy Cottage Creations and Sedruola of Yarn Obsession were on hand and even knitted while the interview was happening! Check out Guido's blog later this week for a posting of the podcast. With only three weeks left in our Downtown Crossing gallery space we still have lots to show and share, and I hope to see YOU in the gallery soon! hours are Thursdays through Sundays, 11am - 7pm, until December 28th.